The newly remodeled Bonfire Room is perfect for almost any event - casual, or formal. Situated at the tip of the Art Marble building, the Bonfire Room features spectacular wrap-around windows, high ceilings, and a cozy bonfire. This room can be configured for sit-down dinners, or casual cocktails at high-top tables. 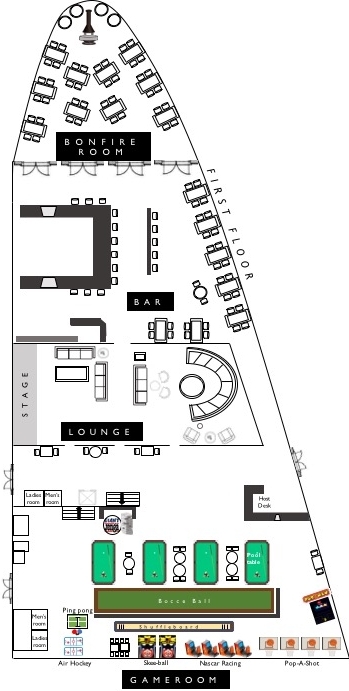 The Bonfire Room and the Great Room are the most versatile event spaces at AM21. The Lounge is perfect for birthdays, casual company happy hours, or game viewing parties. Relaxed and laid-back, this space features non-traditional seating and tabletops. The Lounge is perfect for events with small plates/appetizers and and drinks, but we don't recommend this space if you're seeking a more formal, sit-down dinner. Our main bar is located on the ground floor and is open during business hours. This space is only available to reserve during an entire venue buyout. Our games are free to play! The Great Room is perfect for proms, retirement parties, corporate parties, company meetings/presentations, weddings, receptions, quinceañeras, birthdays, and holiday parties. This space can be transformed to appeal to any gathering, whether it be a casual cocktail hour with football viewings, or a full service wedding ceremony. The Billiards Room is essentially its own private and exclusive Game Room. This space features six pool tables, a ping-pong table, giant Jenga, two foosball tables, and shuffle board. It also features six flat-screen TVs, and a fun environment that is perfect for networking and mingling. The Show Room is perfect for wedding rehearsals, reception dinners, baby showers, retirement parties and anniversaries. The Show Room is the most traditionally formal space at AM21, and the configuration can be easily customized. The Bourbon Room is ideal for corporate celebrations/holidays, intimate birthdays, retirement parties, and anniversaries. Any event that is hoping to offer a swanky, "Great Gatsby" vibe, this space is perfect for the job.